To find and stay in contact with our inner sources of power is an important aspect of health and well-being. To remain centered and maintain a state of calmness in times of stress is without any doubt a big advantage. While listening consciously and with an open mind to the sounds of music, inner doors can open and allow the energy to flow free. Music as a path to inner fitness! 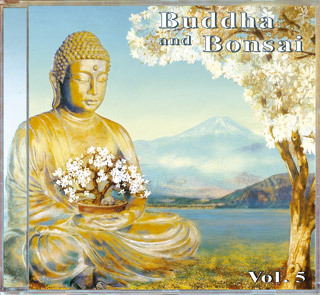 The instrumental tunes of Buddha & Bonsai Vol.5 create an ambience of lightness and depth. The magical meditative atmosphere of this album leads us to instant relaxation and provides us with an easy way to attain peace of mind. The compositions for Pipa, Koto, Shakuhachi, Ti-Tzu (chinese flute), Gu-Cheng, Piano, Guitar and percussion are delicately woven into an instrumental symphony of outstanding sound and production quality. Buddha & Bonsai Vol.5 also forms an excellent background for Tai Chi, Yoga, Qi Gong, Meditation, Reiki and all kinds of holistic energy work. This album is a must for the collectors of the Buddha and Bonsai series and for all fans of genuine, meditative music, produced with heart and soul.